A “time machine” is a plot device frequently used in science fiction. From H.G. Wells’ groundbreaking 1895 novel The Time Machine to Marty McFly’s use of a temporally-enabled DeLorean in Back to the Future, time travel has certainly captured our collective imagination. But the science behind time travel is dubious at best. And even though we can’t actually physically move backward or forward in time, we can at least experience some of the thrills—and benefits—of time travel through temporal analysis. Geospatial professionals are well versed in visualization of spatial relationships and dependencies. But when looking for relationships and dependencies, examining proximity in time can be equally important. Pioneering environmental planner Ian McHarg put great emphasis on chronology, or the placing of geographic layers in chronological sequence to show relationships, dependencies, and causation through time. “We found the earliest events, mainly of geological history, had pervasive and influential effects, not only on physiography, soils, and vegetation, but also on the availability of resources,” McHarg states, describing an early environmental planning study in his book A Quest for Life. He calls his discovery of chronology, or the order or sequence of geographic features through time, “…a most revelatory instrument for understanding the environment, diagnosing, and prescribing.” McHarg’s chronology is an important concept to grasp as it can lead us to a deeper understanding of structure and meaning in the landscape. Using chronology to visualize the past is certainly an important tool to help us understand the present. But can we do even more with this geographic knowledge? Can we use it to predict the future? Predicting the future is an elusive exercise. Just pick up an old magazine from the 1960s that talks about what life will be like in the year 2000, or watch a movie or read a book set 50 years out. While highly entertaining, nobody ever gets it right. Very few get even remotely close. We need to move beyond passively trying to “predict” the future towards actively creating or “designing” the future. The real problem of predicting the future is one of complexity. “There really is only one past” notes Stephen Ervin of Harvard University’s Graduate School of Design, “but there are multiple futures.” So if predicting the future is so difficult, impractical, or downright impossible, should we even bother trying? Is there anything to gain from such folly? 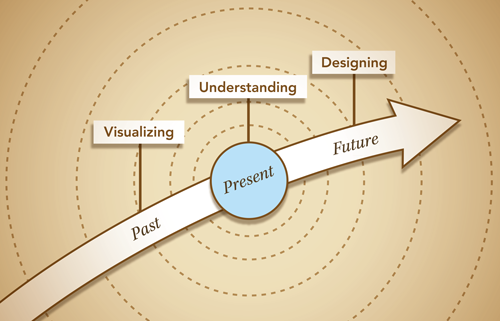 As McHarg states in his book To Heal the Earth, “Processes, laws, and time reveal the present.” Meadows echoes this idea, noting “we experience now the consequences of actions set in motion yesterday and decades ago and centuries ago.” Projecting this same concept of chronology forward in time, we can study the past in order to both understand the present and envision the future. As I heard someone say at the 2012 GeoDesign Summit, “By designing geography, you’re designing history.” We need to embrace this idea. “In a very real way, designers create the human environment,” says William McDonough in Twenty-First Century Design. “They make the things we use, the places we live and work, our modes of communication and mobility.” From a building to a highway, from a city to a utility network, geographic design decisions we make today can have huge consequence on the lives of future generations. We have the geospatial tools and techniques in place to understand how the past has created the present, and through thoughtful and careful application of these same tools and techniques we can more actively design the future. Trying to shape our current actions to ensure the best possible future is a delicate balancing act with many complex factors to consider. But it offers hope for a future ideally suited for both humans and the environment. Instead of asking what the world might look like in the future, we should start asking ourselves: What do we want the world to look like? And how can we make it happen?